"Hello!" - On the Press Start screen. "Press start to play." - When returning to the Press Start screen after watching a demo. "Okey-dokey." - When a file is selected. "Let's-a go!" - When a stage is chosen. "I'm-a tired." - Don't touch anything on the controller for a while and Mario will say this before yawning. "Night-nighty. Ah, spaghetti. Ah, ravioli. Ahh, mamma-mia." - Mario dreams of pasta after he has been sleeping for a few minutes. "So long-a Bowser!" - Mario says this for a long Bowser throw. He says "Here we go!" in the Japanese version for both short and long throws. "D'oh!" - When long-jumping, sliding, or diving into a wall. The Japanese version reused Mario's "Unh!" clip, which is also heard when Mario hits a wall after a standard jump or side somersault. "Boing!" - When bouncing off of a Spindrift's head. "Game over." - On the Game Over screen. Mario will say either "Yahoo! ", "Wha-ha! ", or "Yippee!" during the last (highest) jump of his triple jump technique. In the Japanese game, he says "Yahoo!" every time for the third jump. In the opening sequence, Mario says "Yahoo! Ha ha!" when he leaps out of the pipe. He only says "Yahoo!" in the Japanese version. Mario's "Ha ha!" clip replaces an awkward moment in the Japanese version where there's no music or background noise, just the sound of Mario's feet landing on the ground. If Mario loses a life in a stage, he'll be ejected out of the stage's entrance in the castle. He'll say "Oof! Mamma-mia!" every time in the U.S. version, but the Japanese version won't have the "Mamma-mia" if the stage's entrance was not on a wall. Princess Peach didn't have a voice until the U.S. release. 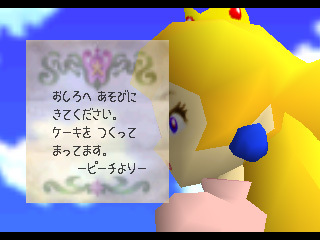 Peach's letter voice-over in the opening sequence and monologue during the ending sequence were provided by Leslie Swan, who also wrote the screen text and co-wrote the manual text for the game. New to the U.S. version's opening sequence are "whoosh" sound effects when the Lakitu cameraman flies under the main bridge, another "whoosh" when Lakitu flies around the pipe, a "click" when the camera switches to Lakitu's point of view, and a "boing" when Mario leaps out of the pipe. In the "U.S." sound file below, the whooshing starts at the 18-second mark, the camera clicks at the 27-second mark, and the boing is heard at the 31-second mark. Music was added when Mario meets the "Lakitu Bros." camerman in front of the castle. Two sound effects were added for some of the castle's secret stages. When Mario enters Tower of the Wing Cap, the "course select" sound effect is heard as the screen turns to white. 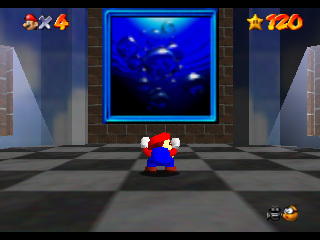 The second added sound effect plays when Mario exits Tower of the Wing Cap, Wing Mario over the Rainbow, Vanish Cap Under the Moat, or The Princess's Secret Slide without getting a Star. In the clip below, you can hear the new sound of entering and exiting Tower of the Wing Cap. Chain Chomp has a deeper voice in the U.S. version, which makes him sound a bit more menacing. The U.S. version has a new Red Coin sound effect that rises in pitch with each coin collected. The sound effect does not change pitch in the Japanese version. 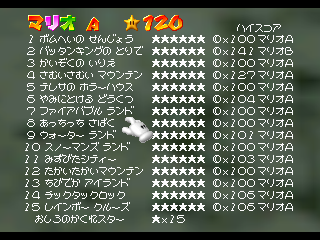 Except for Mario's "So long-a Bowser" clip, the Japan-only Super Mario 64 rumble version has all the new voices, sound effects, and music listed above. We'll have more details about the rumble version's changes in a future update. If you don't press any buttons on the Press Start screen, you'll get to watch several game demos. The first demo that plays in the U.S. versionMario battling Bowseris not in the Japanese version. All other demos from the Japanese version are present, and will play in the same order after the Bowser demo. A "Peach" signature in pink ink was added to the princess's letter in the U.S. version. 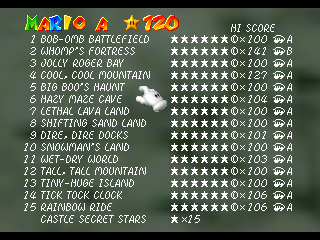 On the score screen, pressing the A button will replace your scores with the high scores, showing which file (Mario A, B, C, or D) they belong to. In the U.S. version, a Mario head icon replaces the word "Mario." The U.S. version's screen looks a bit cramped, so this was probably done to save space. 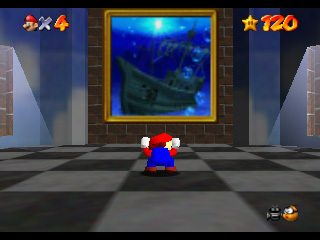 The painting for Jolly Roger Bay (Course 3) was changed from a picture of bubbles underwater to a picture of a sunken ship, while its frame was changed from blue to gold. By picking up the coins that emerge from Bowser's fire breath, you can max out Mario's coin counter during the first Bowser battle. Though it would take a very long time without cheat codes, Mario can collect up to 32,767 coins in the Japanese version. However, going over 999 coins has a weird side effect, so the U.S. version stops the coin counter at 999. アイクン Aikun Eye-kun Mr. I.
Bully: Donketsu means "lowest rank." Money Bags: Gamaguchi means "coin purse." Scuttle Bug: Gasagoso is a rustling sound. Scuttle Bug was renamed "Scuttlebug" in New Super Mario Bros.
Spindrift: Fuwafuwa means "light, airy, fluffy." Swoop: Basabasa is a rustling sound, similar to Scuttle Bug's Japanese name's meaning. Swoop's English name was "Swooper" in Super Mario World. Unagi: His name was changed from "Utsubo" to "Unagi," which is also Japanese for "eel." Utsubo are moray eels. でてこい　きょだいウツボ Detekoi Kyodai Utsubo Come out, Huge Utsubo Can the Eel Come out to Play? メタルで　ダッシュ Metaru de Dasshu Metal Dash Metal-Head Mario Can Move! ビリビリの　まめリフト Biribiri no Mame Rifuto Electrified Tiny Lifts Shocking Arrow Lifts! いそげ！かなあみエレベーター Isoge! Kanaami Erebētā Hurry! Wire Mesh Elevator Express Elevator--Hurry Up! ダウンタウンを　かけろ Dauntaun o Kakero Run Through Downtown Quick Race Through Downtown! おおぞら　アスレチック Ōzora Asurechikku Sky Athletic Tricky Triangles! Special thanks: J.J. (Japanese enemy names) and Mister Breakfast.